Low Carb Zucchini Bread Recipe - Great for Brunch! Easy Low Carb Zucchini Bread. This Keto Zucchini Bread is the perfect treat when you want a baked good while keeping your carbs down. This low carb zucchini bread recipe bakes up beautifully with a texture that is similar to regular spiced bread recipe. This easy zucchini bread recipe is a perfect addition to a keto brunch, great for an on the go breakfast, or top it with butter or cream cheese for a delicious keto snack. IS THIS A HEALTHY ZUCCHINI BREAD RECIPE? We like using walnuts for the omega-3 fatty acids, but feel free to swap the walnuts out for pecans or almonds if you prefer. Preheat oven to 350F; line the inside of an 8 1/2 by 4 1/2-inch metal loaf pan with 2 pieces of parchment paper so it hangs over all 4 sides and spray the corners with coconut or avocado oil. Whisk together the almond flour, flaxseed meal, erythritol, tapioca starch, oat fiber, cinnamon, salt, baking soda, and nutmeg in a large bowl. Whisk together the slightly cooled butter or coconut oil, eggs, cream/water mixture, vinegar, vanilla, and stevia glycerite in a medium bowl. Add the wet ingredients to the dry all at once and stir until combined, being careful not to over-mix. Fold in the zucchini and walnuts. Immediately pour the batter into the prepared pan and bake until a toothpick inserted into the center comes out clean, about 1 hour, 15 minutes. Once it’s done cooking, turn off the oven and let the bread sit in the hot oven for 10 minutes before removing to a wire rack to cool completely. WHEN YOU GRATE ZUCCHINI DO YOU LEAVE THE SKIN ON? Yes! We leave the skin on when we grate our zucchini. It gives the bread a better texture, plus it’s one less step you have to take to make this bread. We like to store our leftover zucchini bread in glass containers instead of wrapping them in plastic wrap or aluminum foil. These containers are air tight and this easy zucchini bread will last for about 1 week in the fridge. You can also freeze the leftover zucchini bread and it should stay good for at least a month. We’ve experimented with a bunch of different low carb zucchini bread recipes and this texture by far has been the best. We can honestly say that this is the BEST zucchini bread recipe we’ve had regardless of carb content. Zucchini nutrition: 17 calories, 3.1g carbs, 1.0g fiber, 2.1g net carbs, 0.3g fat, 1.2g protein. This low sugar zucchini bread serves 10 and has 288 calories per serving. DO YOU NEED TO REFRIGERATE ZUCCHINI? Yes. 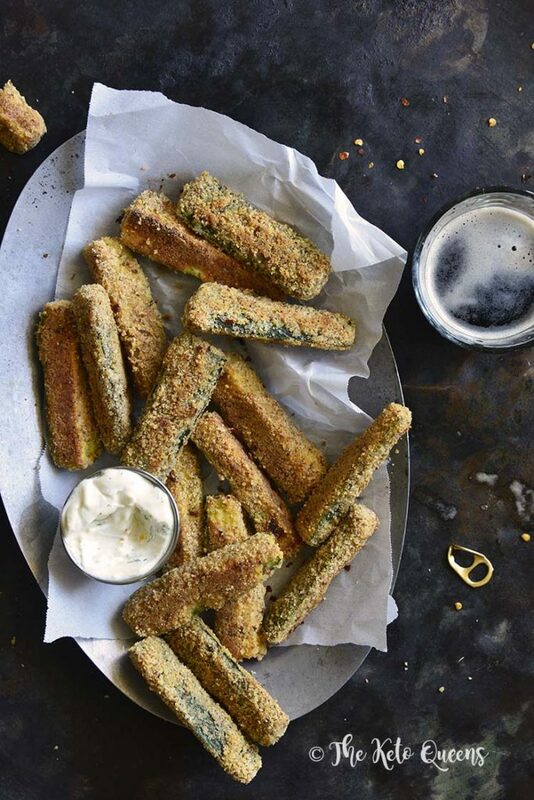 Store your zucchini unwashed in your refrigerator. Wash promptly before using. Washing your zucchini makes it go bad quicker. CAN YOU SHRED ZUCCHINI AHEAD OF TIME? You can shred zucchini ahead of time, but do so with caution. After you shred it, store shredded zucchini in an air tight glass and store in fridge. Shredded zucchini can last 3-5 days, but it may lose some water content. Before using pre-made shredded zucchini, drain off water. 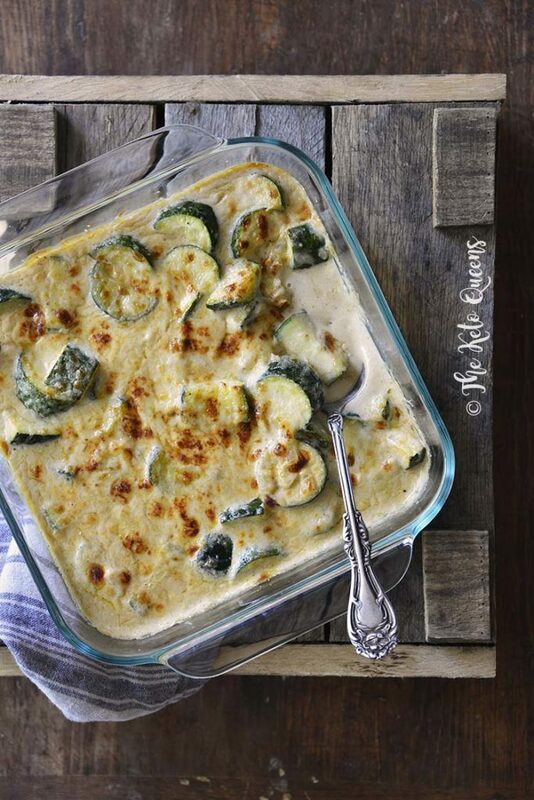 Other low carb zucchini recipes we love! 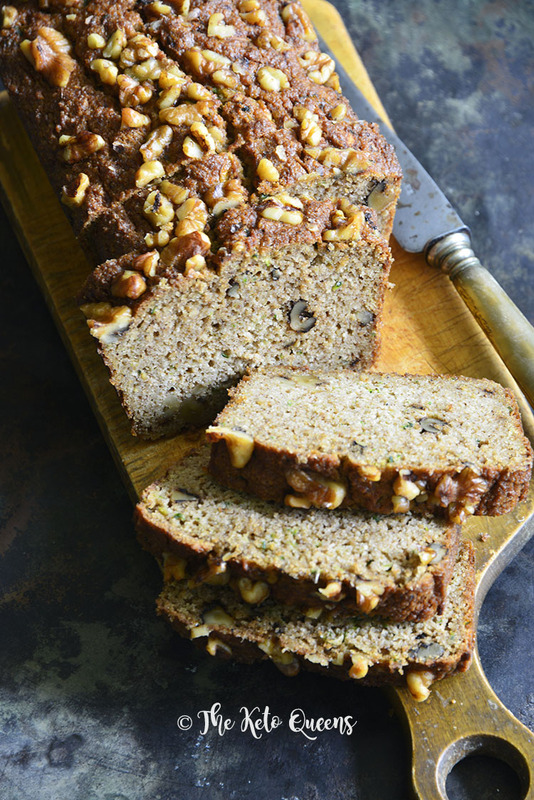 Keto Zucchini Walnut Spice Bread has just the right amount of sweetness with a touch of spice and perfect texture to satisfy your cravings for baked goods! Preheat oven to 350F; line the inside of an 8½ by 4½-inch metal loaf pan with 2 pieces of parchment paper so it hangs over all 4 sides and spray the corners with coconut or avocado oil. Store any leftovers wrapped in the fridge for up to 5 days. What can be substituted for the tapioca starch? Karen, We use a little bit of tapioca starch in this recipe to improve the texture. We haven’t tried this recipe using something else instead; however, you could just almond flour (just note that the texture will be slightly different).